The Oklahoma City Thunder have changed a lot in the time between losing in the NBA Finals up to the 2012-13 NBA season’s All-Star Weekend. Many times, the team has played as dominant as any team—in fact, just last week, the Thunder went on a 4-game romp in which they beat teams by an average of over 20 points, and superstars Kevin Durant and Russell Westbrook have sat out the fourth quarters of those games. There have also been other points that have led many to question whether or not the team still has what it takes to challenge for the NBA title this season. The recent drubbing at the hands of the title favorite Miami Heat heading into the All-Star break is yet another such point during a season where there have seemingly been more questions than answers. It looks like the Thunder can go toe-to-toe with the Los Angeles Clippers, an opponent they couldn’t seem to beat last season. Many Thunder fans have dreaded a potential playoff matchup against the better LA team right now, but that was a story from last season. I honestly believe OKC is still built for a deep playoff push, and there’s a good chance the team makes it back to the Finals. It’s what happens then that has me bothered. It’s looking more and more like the Heat will be taking the East this year. LeBron James is playing absolutely like a monster of late, and don’t think for a second he’ll be slowing down once the ASG is done and the season resumes. Chris Bosh has been efficient, and Dwyane Wade is still a strong contributor. Role players like Mario Chalmers and Ray “the Traitor” Allen (I kid, I kid) have also shown they can step up. Seriously, who’s going to stop the Heat in the East? New York probably has the best chance, but I’m never betting on any Carmelo Anthony-led team against such a dynamic force with a tighter core. So, chances are, if OKC can get past the rest of the West and reach the Finals again, they’ll be up against a team they haven’t beaten since Game 1 of last year’s title series. It’s not even about talent anymore; at some point, repeatedly losing to one team will take its toll mentally. There’s no doubt you can throw away the past results in case these two teams do meet again in the Finals. Still, Durant and Westbrook need to prove that they’re tough enough mentally to keep these defeats from getting in the way of what they and the team could achieve. Then, after that, the Thunder would need really good performances from KD and Westbrook. Durant can’t shoot poorly and turn the ball over like he did in the first half of Thursday’s game. Westbrook has to keep himself in check and steer clear of living and dying by his mid-range pull-up jumper. Scott Brooks also has to realize that Kendrick Perkins isn’t going to solve any of the team’s problems when the Thunder face the Heat. 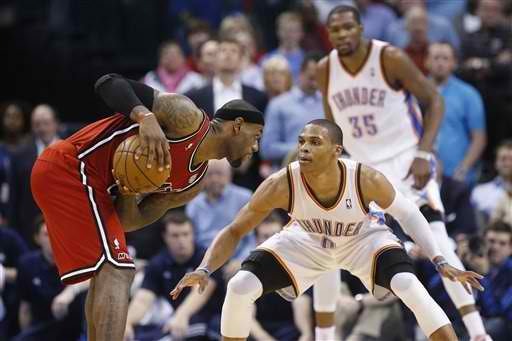 I still believe that OKC is a legit contender. They have as good a chance as any in the West to get to the Finals. Do they have a good chance of wresting the NBA Championship from the Heat, though? The real question now is, can they beat the Heat? Right now, it’s not looking too good. Honestly, I think the Pacers will be Miami’s biggest roadblock in the East, not the Knicks.